Structured Work Sessions are one part of the teaching approach developed by TEACCH (Treatment and Education of Autistic and Communication-related Handicapped Children)—a statewide program serving the autistic population of North Carolina. Administrative Headquarters for the University of North Carolina TEACCH Autism Program are located in Chapel Hill and there are several regional centers around the state. 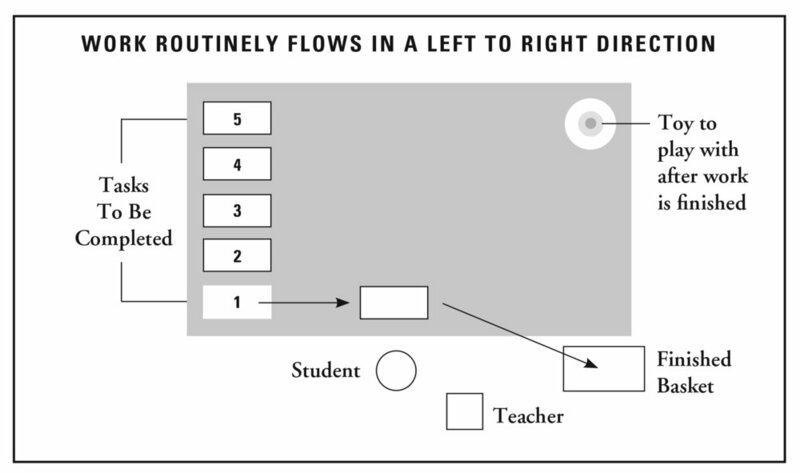 Tasks are located to the student’s left, within easy reach. The number of Tasks (at the discretion of the teacher) tells the student how much work there is to do. The student knows what the work is by the visual structure of each Task. When is the work finished? When all the Tasks have been completed and placed in the finished basket, located to the student’s right. Directly after the student has finished working, there is a toy, treat or indication of where to go next.